This is the scotch of trance: it goes down so smooth. There has been practically an overflow of commercially-centred trance releases over the past few years, the majority of them blending into each other to the point where songs are indistinguishable to one another. Unfortunately, I get to hear so many of them and only a select few manage to stick in my head at all or even capture my attention. However, in a sense it is also a privilege because when I come across that one song that I can immediately declare as a "diamond in the rough", I am filled with a sense of musically aesthetic joy. Such was the case when I first heard the one of the dual set of songs on this double A-sided vinyl; I knew instantly that I had found something especially unique. The duo of Lemon (also known as one half of the not particularly prolific trance group Aven) & Einar K have given us two tracks to work with. Hope, the first offering, was a tune I heard on a dance compilation and was impressed by its smooth synth sound. After a rather soothing but typical trance build-up featuring a secondary melody that shall indeed lead to good things, we arrive at the calm before the storm, or before the climax of the tune as the case may be. A combination of spacey pads, piano tones, and slightly brittle percussion melody guides the way to the primary melody, which employs a wonderful lead synth. This synth could be compared to a glass of finely-aged scotch -- it just goes down so smooth with a modestly toned flavour. I doubt that this particular analogy makes particular sense but that's my individual interpretation. Although the main refrain of the song (the climactic portion) is short-lived, it leaves a blissful mark. My only complaint is that there is only one run of the main melody in each case, instead of two as is usually the case for extended mix releases; this means that you can only enjoy the wonderful sounds of each track within a brief period of time, which is unfortunate. Nonetheless, I am impressed with the overall output of this Norwegian duo. For a group that seemed to pop out of nowhere and then suddenly arrive on the record label Flashover, run by one of the world's most popular DJs (Ferry Corsten), they have truly left a positive impression on me. 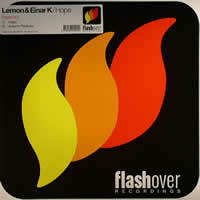 I now look forward to any and all future releases by Lemon & Einar K. This just goes to show that when you put forth a strong effort, you can stand out from the rest of the crowd.